Croatia is not exactly known as a center for electronic, minimal music, but with Luka & Lazo it’s definitely a creative hotspot on the European map of techno. Yet the seclusion over there has its bright side: you don’t hear the same music from the same sales charts everywhere and you can do your very own thing. That’s not too bad considering the Minimal overload these days. On their fourth Mo’s Ferry record since the debut in 2005, Luka & Lazo throw in some new spices from their native „cuisine“. 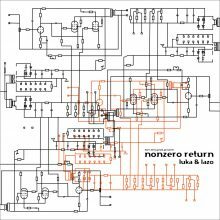 „Nonzero return“ is Techno, is Minimal, is a rocking burner and a tool. The whole thing doesn’t lack the Luka & Lazo kind of Rave but also plays around with Techno and Breakbeats. As always skillful and edgy, manifold and rocking! The release is topped off with a tremulous remix by Dario Zenker. Now it’s time to find a category for that stuff: … Well, yes! Frickelsound!